FINALLY! A blonde female character with HUGE eyebrows! 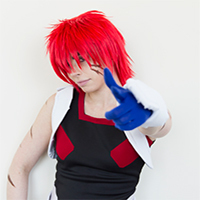 Those of you with nice thin brows have no idea how hard it is to cosplay when you have huge brows like mine! 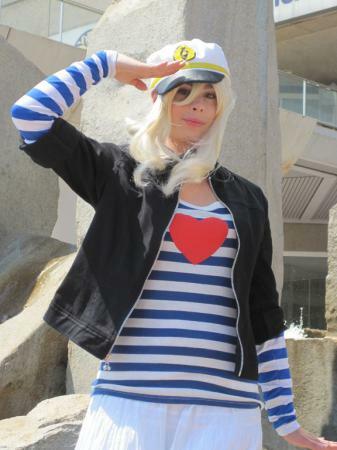 I love this nautical outfit Mugi was wearing in the Listen video, and it was easy enough for me to do. 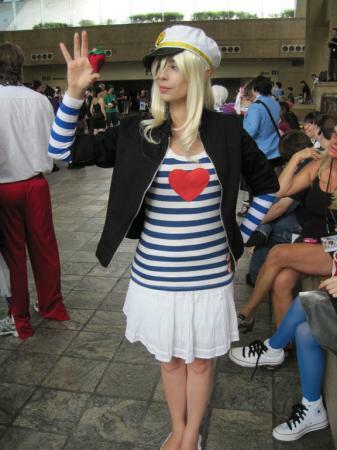 What's also great about this cosplay is that it's not so strange. I wore it (without the wig) to my Spanish class and no one batted an eye at me. Kinda nice. I didn't have to explain myself. 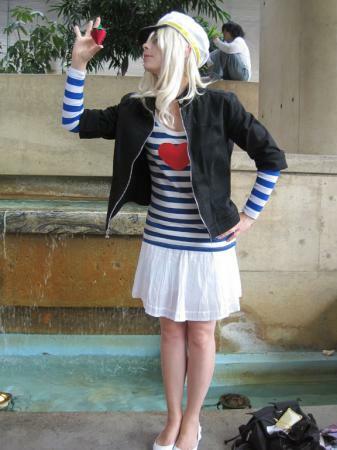 This cosplay looks simple, but it did require some surgery. I had to cut my old skirt a bit shorter and Fray Check the edges. The heart is sewn on because I was to lazy to screen print and I found free red fabric at my school (thank you textile department at FIT!) The shirt I bought from H&M was a short sleeve, but it was inexpensive and I was just getting tired of searching endlessly for a long sleeve striped shirt. I would have had someone make the shirt for me, but I couldn't even find the fabric! I bought a cheap striped tank at Conway so I could make the sleeves, but when I got home, I realized that the blues were completely off! So yeah, that's why my sleeves look a little weird. The hat is also customized from a cheap lil' white hat. I added the seal on the top, the yellow ribbon, and covered the brim with cheap black crappy leather I also got from school.